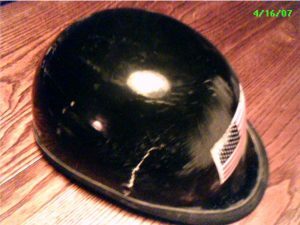 Studies have repeatedly proven that if you are involved in a crash, the single-best thing you can do to better the odds you’ll come out ahead is wear a good quality helmet, preferably one that meets both DOT and Snell standards. Below is information on how to choose a helmet, how helmets work and why you should choose to wear one every time you ride. For the research on helmet effectiveness go to Research – Helmets and Laws. For more information about helmets in the form of educational materials for distribution and presentations, go to our Educational Materials page. SMARTER has compiled a comprehensive Research Reference List regarding motorcycle and motorcycle helmet law effectiveness including economic impacts. HelmetCheck.org: A repository of helmet-related information, research, and public service announcements for the benefit of consumers, policymakers, and law enforcement, this website developed by MIC’s Helmet Task Force not only enables riders to verify that the helmet they own or are considering for purchase complies with the U.S. DOT safety standard FMVSS 218 but also provides them access to consumer information about DOT-compliant helmets produced by helmet manufacturers who voluntarily participate in the database. Choosing a New Motorcycle Helmet: The right helmet can save your life, prevent head injury or reduce the likelihood of head injury in the event of a crash. The wrong helmet can make you miserable on an uneventful 10-minute ride. Making a smart choice takes knowledge and understanding. Below are three (3) sources for quality information regarding Choosing New Helmet. Revzilla is an online motorcycle-gear retailer based in Philadelphia, Pennsylvania. The company sells motorcycle gear, parts and accessories. MotoSport is an online shop that caters to the motorcycle/ATV specific community. What You Should Know About Motorcycle Helmets: MSF, as part of its Cycle Safety Information series, produced this four-page document explaining the basic construction of a helmet, how helmets work, and how to choose one that fits. Bogus Helmets: What You Know Could Save Your Life: The Washington State Patrol, in cooperation with the Washington Traffic Safety Commission, produced this four-page helmet-shopping guide to explain the differences between real helmets that have been manufactured to meet DOT standards and fake, novelty-style helmets with thin shells. How to Identify Unsafe Motorcycle Helmets: A trifold brochure from NHTSA that describes the characteristics of non-compliant helmets (download and print). Get Your Head into It: A safety video by the Motorcycle Industry Council and the Motorcycle Safety Foundation encouraging the use of helmets, especially full-face. What Happens to a Motorcycle Helmet in a Crash? : John Wakefield the Managing director of Phoenix distribution, the leading importers of Arai helmets into the UK explains what happens to a helmet in a crash. Linear and Rotational Forces. Although no two crashes are identical, two main types of force—linear and rotational—are related to the majority of brain injuries. Most real-world impacts actually subject your brain to a combination of both linear and rotational forces. Watch this animated video to learn more. Without Motorcycle Helmets. We All Pay the Price. In the mid-1990s, NHTSA began encouraging states to pass helmet laws, and set aside $330,000 to educate legislators on the issue. One of the components, a video titled “Without Motorcycle Helmets, We All Pay the Price,” featured testimonials from crash survivors and a trauma room physician who compared helmets to “a vaccine” because of the compelling evidence that they reduced brain injuries. Controversy ensued when the Motorcycle Riders Foundation circulated an early cut of the video to its congressional allies, complaining that NHTSA was using tax dollars to lobby against the interests of taxpaying bikers. They found a champion in Rep. Jim Sensenbrenner (R-Wis.) – Harley-Davidson is headquartered in Milwaukee – and in 1998 Congress passed a sweeping measure barring NHTSA from influencing state and local legislators on any pending legislation. Representatives of the agency may appear as witnesses, but only in response to an official invitation. This is a YouTube link the banned video. NTSB Questions and Answers on Motorcycle Helmets: This document answers 14 common questions about helmets, including the one many people assert is why wearing a helmet should not be mandatory by law: Doesn’t the decision not to use a helmet only affect the motorcycle rider or passenger? Debunking Common Claims Against Motorcycle Helmets and All-Rider Helmet Laws: The truth about what you may have heard: Anti-helmet law advocates who want to repeal all rider helmet laws so that they can have the freedom to feel the wind in their hair have been known to “bend the truth” about helmets. In order to convince decision makers to repeal a lifesaving, injury reducing and cost preventing law, they haven’t been entirely truthful about the facts. Here are the FACTS. Should You Wear a Full-face Helmet? Federal Motor Vehicle Safety Standards §571.218 Standard No. 218; Motorcycle helmets (FMVSS No. 218): A standard to establish minimum performance requirements for helmets designed for use by motorcyclists and other motor vehicle users, with the purpose of reducing deaths and injuries to motorcyclists and other motor vehicle users resulting from head impacts. Voluntary and Mandatory Motorcycle Helmet Standards: A paper by Snell Memorial Foundation that explores the claimed inadequacies of DOT and ECE 22-05 and compares to the Snell standards.